First of all, a BIG Happy birthday to the author. Ms. Niccum shared with me via email that this review would be live on her birthday. How fun is that? Tess is an unborn spirit, who is about to embark on a much awaited journey into mortality to a brand new planet called Earth. She is chosen by the Eternals for an important mission, and is put under a rigorous training by a half-human, half-lion Seraph. This training exposes Tess to some of her darkest fears and insecurities. These experiences force Tess to work on her gift as a discerner of thoughts and reader of auras—thus helping her become one of Heaven’s most powerful angels. But even angels falter, and deep inside her a gnawing fear is growing. Will she meet her soul mate in life? 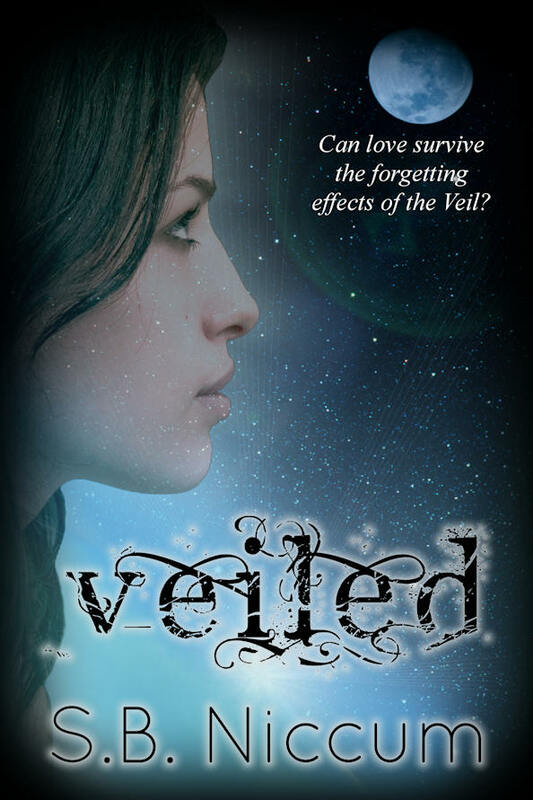 Will their love be strong enough to overcome the forgetting effects of the Veil? And, is she prepared to take on the responsibility of keeping the most dangerous renegade and leader of the Fallen Angels at bay during mortality? If that's not enough to pique your interests, you can check out Veiled's 27!!!!!! 5 star reviews on AMAZON. Now for my take. I found Veiled to be a story with a unique concept that I haven't seen before. I suppose there are books out there with a before-we-lived-on-Earth storyline, but I haven't seen them. Or heard of them. The author creates real characters for us that we can really get involved with, which is a plus for me since I write (and enjoy) character driven fiction. This book is a work of fiction. It is neither doctrine, nor doctrinally correct. This book happened because I let my imagination go wild. If you want to know what is real, read the Scriptures! Now for the fun stuff: how to enter to win your own copy of Veiled. 2. You can earn an entry by being a follower or becoming a follower on MMW's blog/facebook page. Then leaving a comment on this post telling us. 4. Become a follower of S.B. Niccum's BLOG. Don't forget to tell us you have done so. I follow all this awesomeness already :) And going to follow SB's blog right now! and this book sounds really amazing. Sending good luck vibes through the computer so I win it, lol. I follow on GFC and Facebook! I've had my eye on this book for a while now, it sounds soo interesting! Happy birthday! Thanks for sharing your special day with us! This book sounds awesome! Ah! I can't win this one either! No worries, just bought it. Looked too fun to pass up! I want to read this book, it sounds soo good!! I am a follower of MMW's blog, and MMW's Facebook page. So excited to have the opportunity to win this book! Happy Birthday! The book sounds really good!! I am definitely going to be reading it soon. What an interesting plot! It sounds really fun. Well .. COunt me in .. as a follower on S.B. Niccum's blog!! and of-course your blog too!! We are organizing a prompt based writing contest with loads of gifts. I was just thinking of a few books with the concept of before earth-life, but this one is more unique because it has fantastical elements. Sounds interesting. Other books of pre-mortal life: In Your Place by Nunes, the first Great and Terrible book, Dan Yates' Angel books, etc. Thank you all for stopping by and leaving comments! Sorry I couldn't be here on my birthday. I was actually enjoying the 76 degree weather here in Dallas!